Who says the robot assimilation will be all ray guns and smoldering Earth? Maybe the robots will take over the human race from the inside out. We joke, of course – the medical cybernetics field is no real threat to the human race. In fact, these three amazing artificial organs can one day save countless lives. 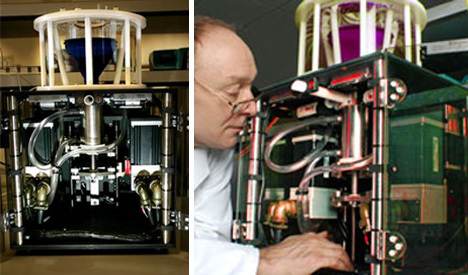 The Biolung from MC3 is an extremely compact, functional artificial lung. A far cry from the iron lungs of decades past, this device is small enough to be implanted in the patient’s chest, helping them to recover from injury or illness or keeping them alive until donor lungs are available. The Biolung is currently being reviewed for approval by the FDA. You certainly wouldn’t win any fashion showdowns wearing this contraption, but for people with kidney disease it could be life-changing. 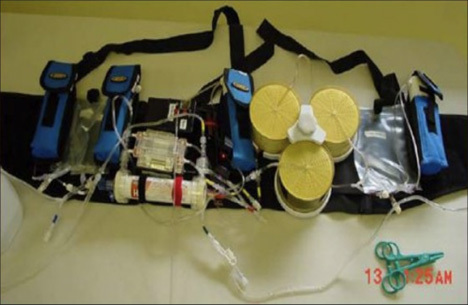 The wearable artificial kidney would replace long, tedious and tiring dialysis treatments during which patients are stuck in a chair or bed. Patients with a wearable kidney would be able to go about their normal daily activities without interruption – much as they did with their own natural kidneys. The device performs dialysis 24/7 and weighs just 10 pounds, including batteries. The technology is still being developed, but with so many people behind the idea it’s moving along quickly. The first artificial stomach was created by a team of British scientists back in 2006 for around $1.8 million. It’s not meant to be strapped to a human body to digest food; rather, it’s the most sophisticated way we have to study how digestion really works. Previous stomach models haven’t functioned in a very realistic way, so this is a bona fide breakthrough. The artificial stomach can “digest” around 24 ounces of food (about half the capacity of a human stomach) and will help scientists understand how the human body breaks down and metabolizes food. The applications are vast: obesity cures, more efficient diabetes treatments, and supplements or medications that can be more precisely time-released in the gut. See more in Cybernetics or under Technology. January, 2010.